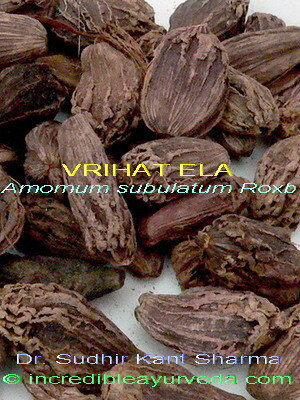 Badi Ilayachi,Vrihat Ela, Sthool Ela.,Greater Cardamom,Amomum Subulatum Roxb. Sanskrit Name:Vrihat Ela, Sthool Ela. Medicinal Properties:It has been traditionally used as a mouth freshener, appetizer, digestive and as an antispasmodic. It stimulates the heart and has also as an expectorant. The seeds are also used as constituents of mouthwashes. Decoction helps to control toothache and dental decay. It helps to control nausea, vomiting, thirst, indigestion, loss of appetite and minor itching or irritations of skin. 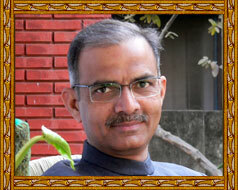 Effect on Dosha:Pacifies Vata and Kapha and aggravates Pitta. Main Classical Uses:Powder of Seeds.